In 1968, to celebrate his forthcoming 80th birthday the following year, Sir Adrian Boult was given by EMI the choice of a major work to record. This distinguished Elgar interpreter might have been expected to choose The Dream of Gerontius but his admirers had to wait a few more years for that. Instead he chose The Kingdom and it was through his fine, dedicated recording (EMI 7 64902-2) that I first came to know and love Elgar’s last oratorio. I wouldn’t go as far as Schuster but I know what Boult meant about Kingdom being a morebalanced work - perhaps because Elgar fashioned his own libretto. Also, I believe that by the time he composed Kingdom, six years on from Gerontius, Elgar had become an even more accomplished orchestrator and a more assured choral writer. Boult’s version, though now starting to show its age sonically, remains a benchmark. Since it appeared there have been two more recordings. One was a sumptuously engineered Chandos set from Richard Hickox (CHAN 8788/9). The other, which I have not heard, was made for RCA Red Seal by Leonard Slatkin but I suspect is no longer available. Sadly, that fine Elgar conductor, Vernon Handley, never had the opportunity to record the work. Every since I reviewed his superb recording of Gerontius I have been hoping that Sir Mark Elder might make a recording of Kingdom and now, here it is. Unlike his Gerontius, which was recorded under studio conditions, this is taken from a single live concert performance. ‘Live’ recordings often include a few edits from rehearsal. I don’t know if that happened here but if it did the edits are completely undetectable and, in fact, I’m pretty sure that what we have here is a single, unedited performance; that’s what it sounds like. Those who worry about applause on CDs can be reassured; unlike Elder’s recent recording of Götterdämmerung applause is absent here. One thing I should say at the start is that if you buy this recording for no other reason - and there are many reasons why you should buy it - do so in order to hear the orchestral playing. That may be an odd thing to say about a choral recording and in saying it I do not mean in any way to disparage the vocal contributions. However, when Elgar wrote The Kingdom he was at the height of his very considerable powers as an orchestrator and his colourful and resourceful orchestral scoring is a major element of this score. I think the composer would have rejoiced to hear his music so magnificently played as it is here by the Hallé. Their playing is truly world class and a vivid testament to the achievement to date of their Music Director, Sir Mark Elder. The playing radiates assurance and a familiarity with Elgar’s idiom. The strings consistently play with richness and flexibility while the woodwind has great finesse. Best of all, the brass section possesses splendid power and authority but, schooled by Elder, this is never overdone. One small example will suffice. Towards the end of Part III, beginning five bars after cue 120 in the Novello score, the brass nobly play the ‘New Faith’ motif (CD 1, track 9, 4:25). In the Hickox recording this is delivered fortissimo and it’s rather grandiose as a result. Elder, like Boult, has noticed that the marking is only forte and the consequent restraint in both recordings is more effective. The LPO plays excellently for Boult on his recording while the LSO is on refulgent form for Hickox. However, I feel that the Hallé surpass both their rivals. They may not be recorded as vividly as the LSO - I’ll comment about the respective recordings later - but they are no less impressive. Also, I feel that Hickox has a tendency to underline points in the score. This rather impedes the natural flow of the orchestral playing in a way that is absent from either Boult’s or Elder’s performances though both of these conductors - and their respective players - consistently display admirable attention to Elgar’s copious markings. The Hallé Choir is by no means put in the shade by their orchestral colleagues. From the very start they sing with great confidence and impressive tone. It’s evident that they’ve been scrupulously prepared by their guest Director, Tom Seligman. I particularly appreciated the dynamic range of their singing. They are capable of producing very exciting loud singing where Elgar requires it but their quiet singing is just as noteworthy. The precision and attack that they bring to the music is excellent throughout, as is the clarity of their diction and altogether I think the choir’s contribution is top-class. The four soloists take respectively the roles of the Blessed Virgin Mary (soprano), Mary Magdalen (mezzo), St John (tenor) and St Peter (baritone). Of these, it is the role of St Peter that is the most prominent though to the soprano falls the very best music in the whole work, the aria, ‘The sun goeth down’. The tenor role is not easy to present. It has its dramatic moments but it is primarily lyrical. In fact, I think Elgar portrayed St. John as The Comforter among the Apostles, and certainly as a more reflective character than St Peter. The challenge to the tenor soloist is to sing the role with sufficient impact but without straying into vehemence, which was the main reason why I thought Adrian Thompson was miscast in the role at a Three Choirs Festival concert this summer (review). Arthur Davies, for Hickox, sings with ringing assurance but, I think, misses some of the humanity for which the role calls. Alexander Young (Boult) is the exemplar in this part and I don’t think John Hudson matches Young. For the most part he sings reliably, though there were a couple of occasions on which he seemed to approach important high notes from below. However, to my ears he doesn’t have the same lyrical grace and ease that Young brought to the music. The mezzo role of Mary Magdalen is sung by Susan Bickley, who so impressed me in Mahler’s Second Symphony at the Three Choirs Festival this summer (review). She makes a fine job of this role too, singing with warm tone and great clarity throughout. I’d say she’s as good as the excellent Yvonne Minton (Boult) and I prefer her to Felicity Palmer (Hickox). She blends well with Clare Rutter in the fresh, lightly scored duet that forms Part II of the work. Later, she has a couple of very important narrative passages. One such is at the start of Part III (“And suddenly, there came from heaven”). Here she’s dramatic and exciting, rising to a thrilling top G sharp. Further on in the work, she’s just as involving in the narration at the start of ‘The Arrest’ (Disc 2, track 3). That narration ushers in the great soprano aria, ‘The sun goeth down’. This is a huge test for the soprano soloist, who has to begin and end the aria in a mood of prayerful contemplation but must rise to great dramatic heights in the central section. Margaret Price (Boult) is peerless here, setting standards that I’ve never heard matched on disc or live. In the outer sections of the aria her singing is rapt, supported with great sensitivity by Rodney Friend (I think), playing the luminous solo violin part. In the middle of the aria the dramatic fervour that Price brings to the music elevates it to the highest level. I’m afraid Margaret Marshall (Hickox) doesn’t match this accomplishment at all. There are some instances of wayward pitching on sustained notes at the start of the aria and, beside Miss Price, she sounds a bit squally in the central section. Clare Rutter may not quite equal Margaret Price but she makes a fine job of this aria. I’d have liked her to sing the opening phrases just a little more softly - especially after Lyn Fletcher has prepared the way so beautifully with a lovely account of the violin solo - but overall her delivery of the more inward passages of the aria shows pleasing sensitivity. When the dramatic intensity of the music picks up she responds with very committed singing. At cue 159 (“The Gospel of the Kingdom”) (disc 2, track 4, 4:55) she’s really fervent yet within a few moments she’s fined things down to produce an exquisite pianissimo on the word “Jesus” (5:57). This is a distinguished piece of singing, which means that the aria is a high spot, as it should be. This is the most important contribution that Elgar gives to his soprano but elsewhere Miss Rutter’s singing is very good, not least in the afore-mentioned duet with Susan Bickley. The key solo role in The Kingdom is the baritone part, here entrusted to Iain Paterson. He sings well and with authority. Once again, the Boult recording sets the benchmark for John Shirley-Quirk is quite magnificent in the role, singing with a marvellous combination of controlled intensity and tonal richness. For Hickox, David Wilson-Johnson does very well without surpassing Shirley-Quirk. I enjoyed Iain Paterson’s singing very much. He brings intelligence to the role and, as I’ve already said, authority. His crucial, long solo in Part III, built around the ‘New Faith’ theme, is a cornerstone of the work and Paterson doesn’t disappoint. He delivers this and his other solos with conviction and at every turn his diction is clear. I had hoped that Sir Mark Elder would prove an authoritative interpreter of The Kingdom and indeed he does. Several things mark out his interpretation. One is an impressive control of pace and structure. That, I suppose, is no surprise given his pedigree as a fine operatic conductor. Another is his attention to detail, respecting Elgar’s copious and vital markings in the score. That, again, should be no surprise to anyone who has heard his previous excellent Elgar recordings. He also demonstrates a great understanding of the score, ensuring that the sentiments it expresses are given their due weight but never letting the music sound sanctimonious. It seemed to me that his choice of tempi was, almost without exception, excellent. Elder displays a mastery of the score that is comparable with Boult’s and he doesn’t indulge in any of the over-emphatic point-making that slightly mar Hickox’s otherwise impressive reading. To cap it all, this is a live recording so we can benefit from the sweep and electricity of the occasion. I should mention the quality of sound in the respective recordings. The Boult recording was made in Kingsway Hall by Christopher Bishop and Christopher Parker. It’s a very good recording but it is now over forty years old and it hasn’t got the same degree of presence and inner clarity as its two more modern rivals. The Chandos recording for Hickox was made in St Jude’s Church, London by Brian and Ralph Couzens. The sound has great presence, indeed punch, and in many ways it’s a splendid achievement. The sound can be thrilling and, as usual with Chandos, a great deal of detail is revealed. However, playing all three recordings on the same equipment and without adjusting the controls made me think that perhaps the fullness of the Chandos sound was just a bit too much of a good thing at times. The engineering team behind this new Hallé recording is exactly the same one that produced Elder’s warmly received recording of Götterdämmerung. I haven’t yet had the time to do more than sample that Wagner recording though what I’ve heard has impressed me. I’m certainly very impressed indeed by this new Elgar recording. It seems to me to present a nicely truthful concert hall balance. The soloists are given a properly prominent position in the aural picture without one feeling that they’re artificially close. The choir, though behind the orchestra is reported with presence while the orchestra is in excellent balance with both the choir and the soloists, allowing one to appreciate their superb playing without feeling that the orchestra is too dominant. It only remains to say that the notes are by the doyen of Elgar commentators, Michael Kennedy, who provides a succinct but completely satisfying note about the work and a good synopsis of the action. I hope that this fine new recording of The Kingdom will enhance the reputation of this marvellous work. It contains a great deal of quintessential Elgar, not least ‘The sun goeth down’. And much of Part III, from the start of St Peter’s extended aria (‘I have prayed for thee’) to the end of that movement, is top-drawer Elgar. The ending of Part III never fails to move me, especially when it’s done as superbly and convincingly as is the case here. As I said earlier, I might not go as far as Frank Schuster in evaluating the respective merits of Gerontius and Kingdom but I feel that Kingdom has been unfairly in the shadow of Elgar’s earlier choral masterpiece so it’s a cause for rejoicing that this splendid new Hallé account is now available. Elder has already given us a recording of the Prelude to The Kingdom as a filler to his recording, with Thomas Zehetmair of the Violin Concerto. That was a different performance of the Prelude, set down in 2005. Reviewing the disc William Hedley said that Elder’s account of the Prelude made him want to hear the complete oratorio again. Well, now he can and I hope he’ll enjoy it as much as I have. With this excellent recording Sir Mark Elder further enhances his reputation as the finest Elgar conductor currently before the public. I hope he will go on before too long to give us a much-needed new recording of the companion oratorio, The Apostles. 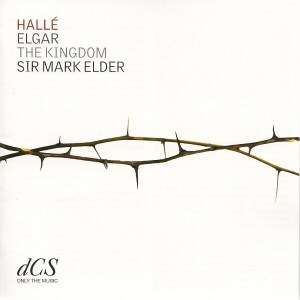 Can I also enter a plea that the Hallé’s evolving Elgar Edition will encompass the shamefully neglected Spirit of England, of which I’m sure Sir Mark would be a fine interpreter? Sir Adrian Boult’s recording of The Kingdom must retain its place as a reference performance, not least because it has the finest quartet of soloists that I’ve ever heard in the work. However, this new Elder interpretation is a worthy rival and should be heard by all Elgar enthusiasts. It is certainly the pre-eminent digital account.